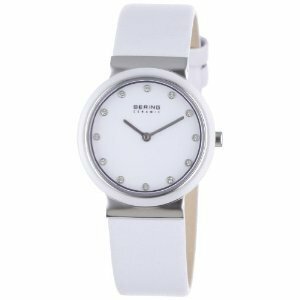 WATCH BERING. STAINLESS STEEL CASE WITH CERAMIC BEZEL, WHITE LEATHER STRAP. DIAL-IN NUMBERS CRSTAL SWAROVSKI. MOVEMENT QUARTZ. SAPPHIRE CRYSTAL 'IRRALLABLE'. THE CASE DIAMETER IS 29mm. WATER-RESISTANT TO 50 METERS. 3 YEARS INTERNATIONAL WARRANTY. PLANE, SIMPLE. ELEGANT.